There are more than 138,000 accounting firms in the United States. For any firm to become one of the ten largest is an accomplishment on its own. The firms that become this large typically do so through regular mergers, acquisitions, and international growth. Keep that in mind when looking through the firms listed, as they could move several places in only a few months. 1.11.1 Which Firms Grew in 2013? 2.1 Determine Your Ideal Job? 2.2 What Qualifications do you Need? 2.8 You’re Hired – You Start Monday! Deloitte currently holds the number one position with an annual revenue of approximately $13,067 million. The firm currently employees more than 56,000 people working out of more than 80 offices in the United States. Their United States headquarters is located in New York City, NY. They are currently lead by Chief executive Joe Echevarria. The firm acquired the Seattle based mobile app developer – Ubermind, the acquisition came as a result of failure to make overtime payments to associates. PwC is in the number two position with an annual revenue of more than $9,550 million. The firm currently employs approximately 35,000 employees in the United States working out of 73 offices. They are headquartered in New York City, NY. Their U.S. operations are led by Robert Moritz. In an attempt to improve the companies risk management, the firm launched a joint business relationship with MetricSteam, Inc. They also announced their collaboration with Microsoft to come up with a portfolio of services, primarily in the tax division. 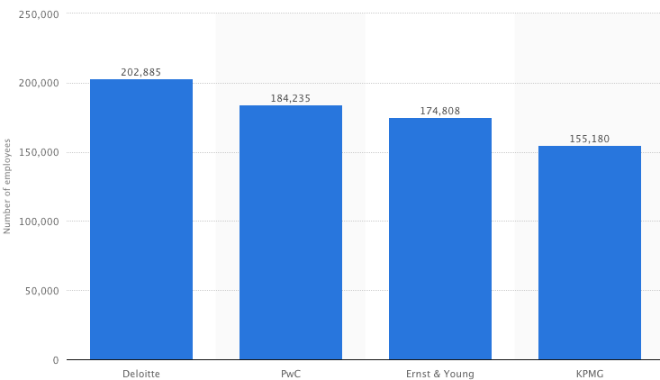 Ernst & Young holds the third position, bringing in a revenue of more than $8,200 million in 2012. The firm currently employs over 29,000 employees. Their U.S. headquarters is located in New York City, NY. The firm is led by Chief executive Steve Howe. The firm announced a new global CEO, Mark Weinberger who is to replace James Turley. They acquired the Philadelphia based financial advisory firm Jeffrey A. Parker & Associates. KPMG is in the number four position, reporting an annual revenue of over $5,750 million. They currently employee more than 24,000 people working from 90 offices in the United States and are headquartered in New York City, NY. The firm is currently led by Chief executive John Veihmeyer. The firm was busy this year suing over associate overtime payments and as a result ended up acquiring Thomson Reuters. They also signed a strategic alliance with BlackLine Systems, a financial close solution developer. McGladrey is right in the middle, holding the number five spot in the top ten. They brought in an annual revenue of just over $1,280 million. The firm currently employ more than 6,500 people and have 75 offices in the United States. They are headquartered in Chicago, IL. The firm is currently led by Joe Adams. The firms staff should have been pleasantly surprised this year, they gave all of their employees iPads and began development of firm-specific apps for them to use. The firm also relocated their headquarters to Chicago this year. Grant Thornton holds the sixth position, reporting an annual revenue of over $1,245 million. The firm employs more than 6,000 working out of 54 offices. They are currently headquartered in Chicago, IL. They are currently led by their Chief executive, Stephen Chipman. The firms seemed to have great growth this year in organics and M&A. They also launched their global brand initiative. In addition, they were one of the six named firms named to oversee banks in a national mortgage settlement. CBIZ/Mayer Hoffman McCann is at the number seven position, bringing in an annual revenue more than $645 million. They are headquartered in Cleveland, Ohio and currently employ 4,010 people working out of 133 offices. They are led by the Chief executives D. Sibits and B. Hancock. The company underwent a merger that combined CBIZ with Mayer Hoffman McCann. The firm acquired state tax consulting group of the law firm Dow Lohnes Price, the acquisition was due to corrupt municipality of Bell. BDO USA ranks at the number eight position in U.S. reporting an annual revenue of $618 million. The firm employs 2,771 people who work out of 42 offices nationwide. They are headquartered in Chicago, IL. They are led by Chief executive Wayne Berson. The company merged in New York and Los Angeles based Salibello & Broder which helped their annual revenue. The merger came as a result of tax issues for Salibello & Broder. Crowe Horwath holds the ninth position in the top ten. The firm reported an annual revenue of $595 million. They currently employ 2,603 people in the U.S. working out of 28 offices. The firm is headquartered in Oak Brook Terrace, IL where they are led by Chief executive Charles Allen. The firm announced the addition of the Dynamics automotive consulting team from the Chicago based ExtOrg. CliftonLarsonAllen earned the tenth position on the top ten, they brought in an annual revenue of $568 million. The firm currently employs 3,223 people in the U.S., who work out of 90 offices. The firm is headquartered in Milwaukee, WI where they are led by Chief executive Krista McMasters. 2012 is the first year that this firm has appeared on the list, they focused on “capitalizing on merger synergies and merger integration” which helped them to grow and gain higher revenues. There seems to be a trend with those in the top ten, the higher ranking often seem to have more partners, less offices, and fewer total employees. It looks as if those who are higher ranked are saving money in the labor division of their firms, by having more partners and fewer overall employees. Which Firms Grew in 2013? In 2013, the accounting firms with a large manufacturing interest made the largest gains. With 78 firms reporting growth in this category. Midsized businesses also helped several firms grow this year with an increase of 74 percent. Franchising and auto dealerships were at the bottom of the list for growth this year, but they did help out somewhat. Are you an aspiring accountant? 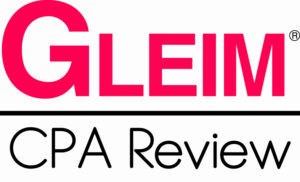 Would you like to work for one of the largest public accounting firms in The United States? Below, we listed the steps it takes to land an entry level paid position with one of the well known firms. • Do you prefer tax, auditing, consulting, advising, etc…? • Do you want to promote up to a senior position at a large public firm? • Do you want to eventually leave and start your own small business? • Do you want to live in the city or a smaller town? Answering these simple questions will help you identify what it is you want, then we can figure out how to get there. Hopefully you have figured out what your dream job is, now do some quick online research to find out what certificates, college degrees, or professional licenses are required. Then we can start looking at where to get those credentials. • Did you just graduate high school? • Are you a business major currently attending university? • Are you a stay at home mom looking to start a new career? If you can get accepted, and afford a well-known university (Penn, USC, Berkley, etc…) you should go there. These schools offer the best opportunities for jobs down the road. If for some reason a well known four-year school is not possible you still have some good options. 1. Enroll in an online school. With online schools you need to be careful. Many are not accredited and will not be worth your time. However, there are select off-campus programs that offer well respected bachelor and master degrees in both accounting and business. These programs are typically less expensive than universities and allow you to acquire your degree on your own schedule. 2. If you would prefer to stay local and attend an on-campus program, you can always enroll in junior college. Although a bachelors degree is rarely offered, you can take some of your general education classes there first. Hands-on experience is extremely important for aspiring accountants. Look anywhere you can for accounting or financial services related experience. Anything you can get will help you land a job down the road. 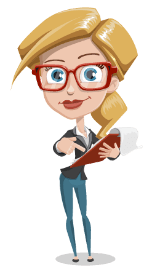 Finding a local accounting firm or private CPA company that will take interns or volunteers. To intern with a large public firm, you can contact college business departments about recruiting, attend job fairs, or contact the firms directly to ask about opportunities. Although not required to be hired by the top firms, getting your CPA before starting a new job is advisable. 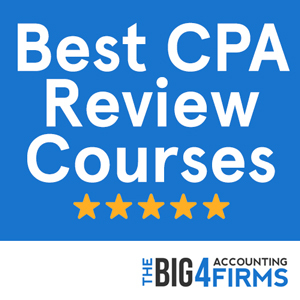 The CPA Exam is notoriously difficult and it will be far more difficult to focus on your studies once you’ve started a new job. However, if you wait until after being hired, many public firms will ‘sponsor’ you or offer you financial incentive for passing. Hopefully by now you have the proper educational qualifications, some hands-on experience, and maybe ever your CPA – congratulations! Next, it’s time to start looking for a full-time paid position with a top firm. Use all the resources at your disposal to connect with firms for new-hire information. Firms typically hire in groups, so make sure not to miss out. Prepare your resume, CV, and your sharpest attire. Learn as much about the company you are interviewing with as possible. Make sure they know you’re taking this opportunity seriously. Interviews are often made to seem scarier than they really are. The business looking for new hires is typically hoping for two things from a new employee. 2. Easy to get along with. The busy season can mean long, stressful hours with the same people, you want others to like having you around. So be friendly and maintain a positive attitude during your interview. You’re Hired – You Start Monday! Congratulations! If you’ve followed the steps so far, there is a very good chance you’ll get the job you wanted. But now the real work starts. When you start your new job remember that first impressions are extremely important and do your best to show off your best qualities early.